[S3] GRO Indexes 1882/Q3 Hambledon Volume 2a Page 1888. [S4] Census Records RG13 Piece 604 Folio 54 Page 5. [S3] GRO Indexes 1924/Q4 Guildford Volume 2a Page 145 age 64. [S3] GRO Indexes 1929/Q3 Guildford Volume 2a Page 145 age 71. [S3] GRO Indexes 1867/Q3 Kingston Volume 2a Page 22. [S3] GRO Indexes 1892/Q2 Cuckfield Volume 2b Page 308. [S4] Census Records RG13 Piece 620 Folio 69 Page 7. [S41911] UK Census 1911 (RG14) - 2 April 1911 RG14PN3169 RG78PN117 RD35 SD2 ED13 SN65. [S3] GRO Indexes 1937/Q4 Brighton Volume 2b Page 354 age 70. [S41939] National Register - 29 September 1939 RG101/2443E/004. [S3] GRO Indexes 1951/Q1 Surrey S W Volume 5g Page 1302 age 83. [S41939] National Register - 29 September 1939 RG101/1955C/023/04. [S3] GRO Indexes 1893/Q2 Hambledon Volume 2a Page 145. [S4] Census Records RG14PN3169 RG78PN117 RD35 SD2 ED13 SN63. [S3] GRO Indexes 1920/Q1 Guildford Volume 2a Page 168. [S3] GRO Indexes 1921/Q2 Guildford Volume 2a Page 201. [S3] GRO Indexes December 1952 Surrey Souith Western Volume 5g Page 1011 age 59. [S3] GRO Indexes 1894/Q3 Hambledon Volume 2a Page 141. [S3] GRO Indexes 1952/Q3 Surrey South Western Volume 5g Page 619. [S4] Census Records RG13 Piece 619 Folio 33 Page 32. [S4] Census Records RG14PN3158 RG78PN117 RD35 SD2 ED2 SN116. [S3] GRO Indexes 1950/Q4 Aldershot Volume 6b Page 11 age 82. [S3] GRO Indexes 1861/Q1 Aldershot Volume 6b Page 35 age 93. [S3] GRO Indexes 1895/Q3 Hambledon Volume 2a Page 158. [S3] GRO Indexes 1897/Q2 Hambledon Volume 2a Page 147. [S3] GRO Indexes 1906/Q2 Hambledon Volume 2a Page 175. [S3] GRO Indexes May 1985 Taunton Deane Volume 23 Page 1472 age 79. [S3] GRO Indexes 1907/Q4 Hambledon Volume 2a Page 174. [S3] GRO Indexes 1936/Q3 Surrey South Western Volume 2a Page 1257. [S3] GRO Indexes September 1993 Surrey North Western Reg 25B District 7582A Entry 152 age 80. [S3] GRO Indexes October 1996 West Surrey Reg E1B District 7611E Entry 44 age 89. William George Moore was born in 1898 in Dorking, Surrey, England.1 He was the son of James Moore and Alice Rapley. He was baptised on 21 August 1898 in Holmwood, Surrey, England.2 He was the son of James Moore and Alice Moore in the 1901 census in 4 Boarded Cottage, Dorking, Surrey, England.3 He was the son of James Moore and Alice Moore in the 1911 census in Redlands Cottage, Holmwood, Surrey, England.4 George served as a Private in South Staffordshire Regiment No 40743 having enlisted in Dorking. He had formerly served in the Essex Regiment as No 23525.5 He died on 3 October 1917 in Belgium he died of wounds.5,6 He was buried in Lijssenthoek Military Cemetery, Boescheepseweg, Poperinge, Belgium, plot XXV. A. 16.7 George's mother received a war gratuity of £2 8s 8d on 14 December 1917 and £3 on 19 November 1919.6 George appears on the plaque in St John the Baptist, Wonersh, Surrey, England. [S3] GRO Indexes 1898/Q3 Dorking Volume 2a Page 168 - mother Rapley. [S41901] UK Census 1901 (RG13) - 31 March 1901 RG13 Piece 623 Folio 44 Page 15. [S41911] UK Census 1911 (RG14) - 2 April 1911 RG14PN3192 RG78PN119 RD36 SD2 ED11 SN94. [S7] Ancestry All UK, Soldiers Died in the Great War, 1914-1919. [S3] GRO Indexes 1857/Q4 Dorking Volume 2a Page 105. [S3] GRO Indexes 1885/Q4 Dorking Volume 2a Page 251. [S4] Census Records RG12 Piece 575 Folio 32 Page 14. [S41891] UK Census 1891 (RG12) - 5 April 1891 RG12 Piece 575 Folio 32 Page 14. [S3] GRO Indexes 1939/Q1 Surrey North Eastern Volume 2a Page 79 age 81. [S3] GRO Indexes 1855/Q1 Dorking Volume 2a Page 91. [S41861] UK Census 1861 (RG9) - 7 April 1861 RG9 Piece 440 Folio 27 Page 7. [S41881] UK Census 1881 (RG11) - 3 April 1881 RG11 Piece 795 Folio 32 Page 10. [S41939] National Register - 29 September 1939 RG101/1883K/003. [S3] GRO Indexes 1944/Q4 Surrey SE Volume 2a Page 682 age 88. Minnie Moore was born on 10 February 1887 in Holmwood, Surrey, England, she was the twin of Lily.1 She was the daughter of James Moore and Alice Rapley. She was the daughter of James Moore in the 1891 census Boarded Cottages, Holmwood, Surrey, England.2 She was the daughter of James Moore and Alice Moore in the 1891 census Boarded Cottages, Dorking, Surrey, England.3 She was the daughter of James Moore and Alice Moore in the 1901 census in 4 Boarded Cottage, Dorking, Surrey, England.4 She appeared in the 1911 census in 67D Upper Tulse Hil, Lambeth, London, England. Working as a housemaid to Otto and Bertha Passarant. Otto was a fur hat manufacturer.5 She married James Albert Walter Killick on 14 November 1920 in All Souls, Newington, London, England, after the banns had been read. The ceremony was witnessed by Henry Thomas Killick and Rosina Eleanor Stanley. James was a an engineer's draughtsman and his father of exactly the same names was a warehouseman deceased. Minnie's father was also deceased and was described as a forester. Both James and Minnie lived at 214 Grosvenor Terrace in Camberwell.6 She died on 8 September 1935 in 5 Brunswick Square, Camberwell, London, England, at age 48 her usual address was 214 Grosvenor Terrace in Camberwell.7,8 Her estate was probated on 8 November 1935 in London. Administration papers were issued to her husband and her estate was valued at £327 4s 9d. [S3] GRO Indexes 1887/Q1 Dorking Volume 2a Page 158 - mother Rapley. [S41911] UK Census 1911 (RG14) - 2 April 1911 RG14PN2113 RG78PN73 RD25 SD5 ED14 SN2. [S3] GRO Indexes 1935/Q3 Camberwell Volume 1d Page 644. [S3] GRO Indexes 1889/Q1 Dorking Volume 2a Page 159 - mother Rapley. [S3] GRO Indexes 1890/Q4 Dorking Volume 2a Page 145 - mother Rapley. Alice Eveline Moore was born on 20 July 1895 in Holmwood, Surrey, England.1 She was the daughter of James Moore and Alice Rapley. She was baptised on 15 September 1895 in St Mary, Holmwood, Surrey, England, her father was a labourer.2 She was the daughter of James Moore and Alice Moore in the 1901 census in 4 Boarded Cottage, Dorking, Surrey, England.3 She was the daughter of James Moore and Alice Moore in the 1911 census in Redlands Cottage, Holmwood, Surrey, England.4 She married Percy John Hotston-Moore in 1936 in Surrey, England.5 Percy and Alice lived in Bibscote, 19 Kiln Meadows, Fairlands Estate, Worplesdon, Surrey, England.6 She died in November 1990 in Surrey, England, at age 95. [S3] GRO Indexes 1895/Q3 Dorking Volume 2a Page 168 - mother Rapley. [S3] GRO Indexes 1936/Q3 Surrey South Eastern Volume 2a Page 1573. [S3] GRO Indexes 1879/Q2 Dorking Volume 2a Page 139 - mother not given. [S41901] UK Census 1901 (RG13) - 31 March 1901 RG13 Piece 623 Folio 33 Page 26. [S3] GRO Indexes 1986/Q2 Surrey Mid Eastern Volume 17 Page 148 age 99. Malcolmson Gardiner Donahoo was born on 7 December 1873 in Kennington, London, England.1,2,3 He was the son of Thomas Malcolmson Donahoo and Anna Eliza Mary Gardiner. He was baptised on 31 December 1873 in St Mary's, Lambeth, London, England, his father was a surgeon and the family lived in 129 Blackfriars in London.3,4 Malcolmson was educated at Charterhouse School 1888 to 1891. His school house was Weekites and he matriculated for Clare College, Cambridge in 1892 where he received a BA 1895. He was admitted as a solicitor in February 1901. The Record of Service of Solicitors and Articled Clerks shows that he was admitted February 1901, practised at 28, St Swithin's Lane London EC.5,6,7 He was the son of Anna Eliza Mary Donahoo in the 1901 census in Savoy Mansions, Strand, London, England. Malcolmson was a solictor.8 Malcolmson was a member of the Westminster and Keystone No 10 Freemason Lodge.9 He married Annie Burlison, daughter of John Burlison and Elizabeth Sarah Grylls, in 1904 in Hendon, London, England, Annie was sometimes called Nancy. I suspect they met as Annie's brother John attended also Clare College in Cambridge like Malcolmson.10 He received the probate of the estate of Elizabeth Sarah Whitaker on 28 May 1909.11 He was listed as head of household in the 1911 census in Hobbs Farm, Oxted, Surrey, England. Malcolmson was a solicitor living with his wife. Annie's two sisters were visiting in their 10 roomed home. Three servants completed the household. I have been unable to trace where their daughter Anna was living at the time.12 He enlisted on 8 October 1914 as a Private, in the Sportsman's Battalion, 1/24 Royal Fusiliers.9 He was posted to Hornchurch in Essex for training where he applied for commission from Hut 3 at the Town’s Barracks on 31 January 1915.3 He was commissioned as a Temporary 2nd Lieutenant in the King’s Own Yorkshire Light Infantry on the 21 February 1915 and was posted to the 8th Battalion of his regiment at Borden Camp in Hertfordshire . He embarked for France with his battalion at Southampton on the 27 August 1915 and landed at Le Havre later the same day. 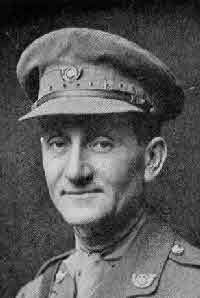 He was promoted to Lieutenant on the 2 July 1916 and to Acting Captain while commanding a company on the 1 August 1916, a rank he relinquished on the 25 January 1917 on being wounded.5,3 He was awarded the Military Cross on 11 November 1916 for conspicuous gallantry in action. He led his company with great courage and determination, capturing and holding the position for thirty hours. He set a splendid example to his men.5,13 On 23 January 1917 the 8th Battalion King's Own Yorkshire Light Infantry carried out a raid on German trenches at Sanctuary Wood in the Ypres Salient. At 9pm, after a short barrage from supporting artillery a part of three officers and one hundred men raced across no man's land and entered the enemy trenches which they found to be unoccupied. During the fifteen minutes they were there before pulling back they came under a heavy bombardment from the German artillery. Casualties for the raid were three officers wounded with one man killed, forty nine wounded and seven men missing. Captain Donahoo, who had not been involved in the original raid, volunteered to go into No Man's Land to search for the missing men. Almost immediately he was spotted by an alert German sniper and shot and seriously wounded. He was rescued from no man's land and was evacuated to 10 Casualty Clearing Station where he succumbed to his wounds. Captain Donahoo was an extremely loved and popular officer whose passing was commented upon in the 23rd Division's History.6 Nancy received a telegram dated the 25 January 1917: "Regret to inform you O.C. 10 Casualty Clearing Station in the field reports January twenty fifth Capt. M.G. Donahoo MC Yorkshire Light Infantry dangerously wounded gunshot wound right leg compound fracture femur. Further news wired immediately received." She received a further telegram dated the 1 February 1917: - "Deeply regret to inform you Capt. M.G. Donahoo MC Kings Own Yorkshire Light Infantry died of wounds January thirty first. The Army Council express their sympathy. "3 He died on 31 January 1917 in Belgium at age 43.5 A memorial service was held in his memory at the Chapel Royal, Savoy on the 23 April 1917.3 Malcomson's death appeared in the 17th list of war dead in the Carthusian of April 1917. The entry in The Carthusian of July 1917 on page 112 reads: The late Capt. Malcolmson Gardiner Donahoo (M.C. ), King's Own Yorkshire Light Infantry. There will be many Cambridge men of the early nineties who will cherish an affectionate remembrance of Malcolmson Donahoo. He came up to Clare College from Charterhouse in 1892. He had no record of athletic distinctions behind him to serve as an introduction to a college in which athletic prominence counted very high; but by sheer strength and simplicity of character, by his genius for loyal freindship, he won an unsought popularity not only in the college but throughout the whole University. And there was no trace of priggishness in him; he had the true Irish love of fun and sense of humour, and an immense and most infectious cheerfulness which made him the most sought after guest at the social gatherings of the time. When the war came he was over the fighting age, ideally happy in his married life and living the country life he had always looked forward to. It would have been easy for him to obtain a commission, but with characteristic modesty and thoroughness he preferred to learn his work in the ranks, and he joined the Sportsman's Battalion in October 1914, and served as a private for five months. He obtained a commission in the King's Own Yorkshire Light Infantry in March 1915, and the same qualities which had endeared him to his friends found their fair play in him as an officer and leader of men. For he understood men, and they loved him for his unerring sense of fairness, his quick sympathy and understanding, and his unfailing cheerfulness. From a letter written by his Brigade Comander: "His memory will live long in the Battalion as a very fine example of what an Officer should be. Duty was always first with him, and he shared all the dangers and hardships with his men. He especially distinguished himself on 1 October 1916, near Le Sars when his Company attacked the German position: and no award of the Military Cross was more deserved, and none gave me more pleasure to hear of, than that won by Captain Donahoo. [S3] GRO Indexes 1874/Q1 St Saviour Volume 1d Page 54. [S23] E-mails between John Hamblin and Jan Cooper from 19 March 2016. [S41891] UK Census 1891 (RG12) - 5 April 1891 RG12 Piece 243 Folio 48 Page 5. [S3] GRO Indexes 1904/Q2 Hendon Volume 3a Pahe 461. [S41911] UK Census 1911 (RG14) - 2 April 1911 RG14PN3264 RG78PN123 RD38 SD1 ED21 SN119. [S40000] Various websites Charterhouse school records. [S12] Charterhouse Website archives The Carthusian April 1917 and July 1917. [S1] Wonersh History Society Archives Parish Magazine September 1918. [S41881] UK Census 1881 (RG11) - 3 April 1881 RG11 Piece 222 Folio 68 Page 5. [S41891] UK Census 1891 (RG12) - 5 April 1891 RG12 Piece 138 Folio 44 Page 38. [S41901] UK Census 1901 (RG13) - 31 March 1901 RG13 Piece 1227 Folio 19 Page 29. [S41939] National Register - 29 September 1939 RG101/1957B/021. [S3] GRO Indexes 1961/Q1 Harrow Volume 5f Page 422 age 82. [S3] GRO Indexes 1846/Q2 Stepney Volume 2 Page 481. [S41851] UK Census 1851 (HO107) - 30 March 1851 HO107 Piece 1565 Folio 508 Page 45. [S4] Census Records RG9 Piece 334 Folio 178 Page 41. [S3] GRO Indexes 1861/Q3 St George S Volume 1d Page 133. [S3] GRO Indexes 1868/Q2 Lambeth Volume 1d Page 543. [S7] Ancestry England & Wales, Civil Divorce Records, 1858-1911. [S3] GRO Indexes 1890/Q3 Lambeth Volume 1d Page 247 age 74. [S3] GRO Indexes 1904/Q1 Kensington Volume 1a Page 86 age 63.